Back in the dark ages of 1968, an ecologist, name of Garret Hardin, wrote a piece for the journal Science called “The Tragedy of the Commons.” The idea Hardin presents is relatively simple: Individuals acting independently and rationally according to their own economic self-interest can behave contrary to the best interests of the whole group by taking advantage of common resources. Hardin’s essay expands on the Malthusian theory that when a population increases at a rate faster than its means of subsistence, then, unless the growth rate is checked by moral restraint or by disease, famine, war, or other disaster, widespread poverty and social degradation will inevitably result. Such effects are the consequence of an unsustainable consumption of resources. Consider, for example, the events on St. Andrews island in the Bering Sea. In August 1944, the U.S. Coast Guard established a small base there. 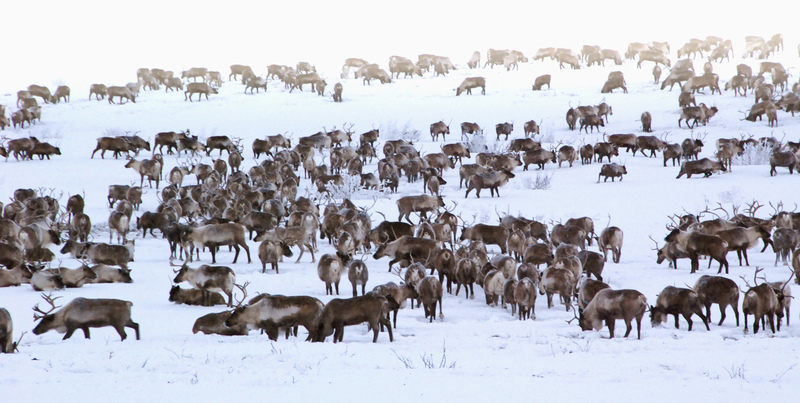 As a back up food supply, they had 29 reindeer shipped to the island. The animals landed in an ungulate paradise: lichen mats four inches thick carpeted large areas of the island. The only predator was the men on the island and they left at the end of the war without having killed any of the reindeer, leaving them to fend fro themselves. In 1957, Dave Klein, biologist working for U.S. Fish and Wildlife Service, visited the island. At that time Klein counted 1,350 very fat and happy reindeer. But the dark shadow of Malthus was looming large. Klein returned in 1963 and estimated there were 6.000 in the herd. 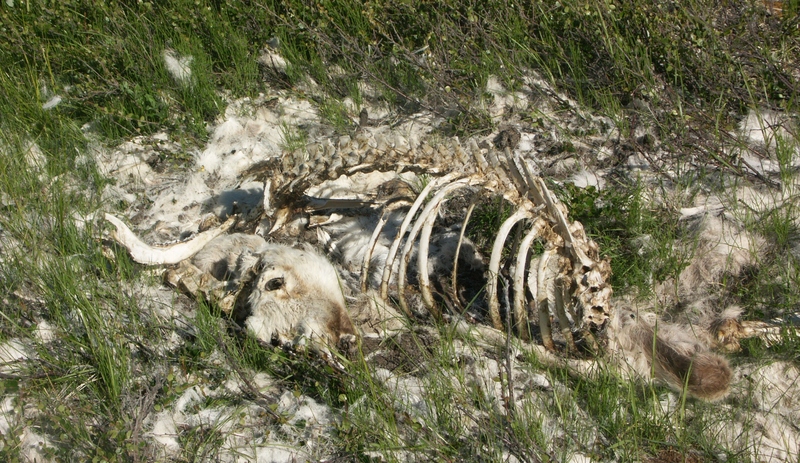 When Klein returned in the summer of 1966, he, another biologist and a botanist found the island covered with skeletons; they counted only 42 live reindeer. There were no fawns and only one sickly looking male. Shortly thereafter, the 32-mile long, four-mile wide island of St. Matthew was barren of reindeer. But reindeer are migratory animals and can travel more than 3,000 miles per year. Being trapped on an island that offered no more than 1% of that distance, their limited resources were unable to be replenished in the face of a growing population. Then, too, they lacked the planning skills of we humans. 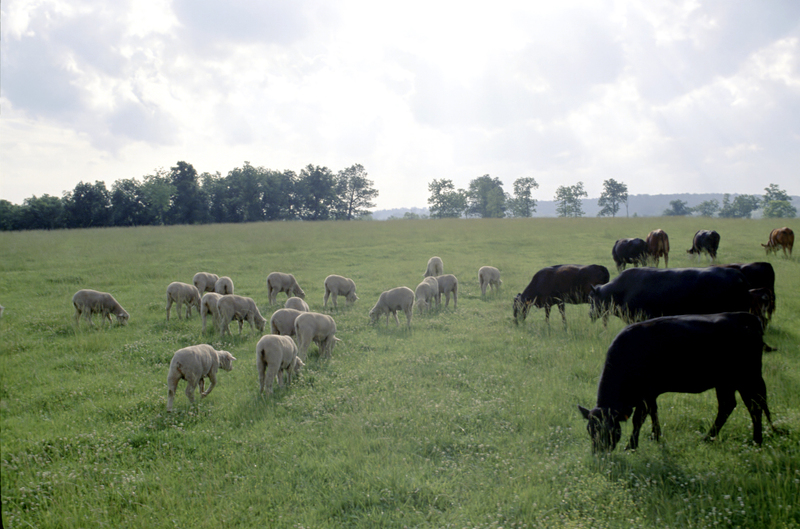 As to the tragedy of the commons involving humans, Dr. Hardin uses the example of herders sharing a common parcel of land on which they are each entitled to let their cows graze. In England, shepherds sometimes grazed their sheep in such common areas. But the sheep ate more grass than the cows. If a shepherd added more sheep in his self-interest to get more economic benefits, then overgrazing results and the common could be depleted or even destroyed to the detriment of all; i.e., the tragedy. This is an example of the tension between individuals and their particular group with respect to a limited but common resource available to all. Under such conditions, as the individual tries to gain an advantage for his or her self-interest, the interest of the whole group suffers. But even the private ownership of property, which would allow for management and maintenance of the resource, does not solve the problem. For instance, the Grand Banks off the coast of Newfoundland was once regarded as home to an endless supply of cod fish. In the 1960s and 1970s, advances in fishing technology allowed huge catches of cod. 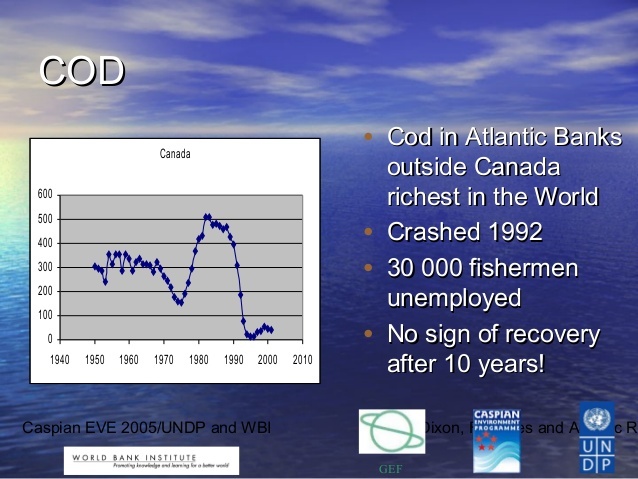 As a result, the fish populations dropped and by the 1990s, cod populations were so low that the Grand Banks fishing industry collapsed. It was too late for regulation and management; the cod stocks had been irreparably damaged. Since then, the cod populations have remained low, and some scientists doubt the Grand Banks ecosystem will ever recover. Then there is drought in California and the availability of water from aquifers. These underground water sources are mostly used by farmers for irrigating crops. But when the farmers upstream of the aquifer take too much water, leaving those downstream with too little, the end result is a reduction of this resource to many farmers and thus a drop in the food supply for all, along with an increase in cost. The consequences of Hardin’s theory can also been seen in our capitalistic economy – where self-interest flourishes. The stock market crash of 1929 and the resulting Great Depression, the Savings and Loan debacle in the 1980’s, the “Dot-Com” bubble in the late 90’s, and the “Housing” bubble that lead to the current Great Recession in 2008, are all examples of individuals and businesses pursing their own self-interest, aided and abetted by banks and brokers, until it blew up in their faces and, in the doing, brought down many millions who were just minding their own business. These days, for-profit corporations pledge their allegiance more to stockholders than stakeholders, especially labor; its financial capital over human capital. High unemployment rates allow business to keep wages low, sometimes to the point where underpaid employees need government-funded welfare to make ends meet. And welfare comes from taxpayers, which, in effect, subsidize companies’ profits. 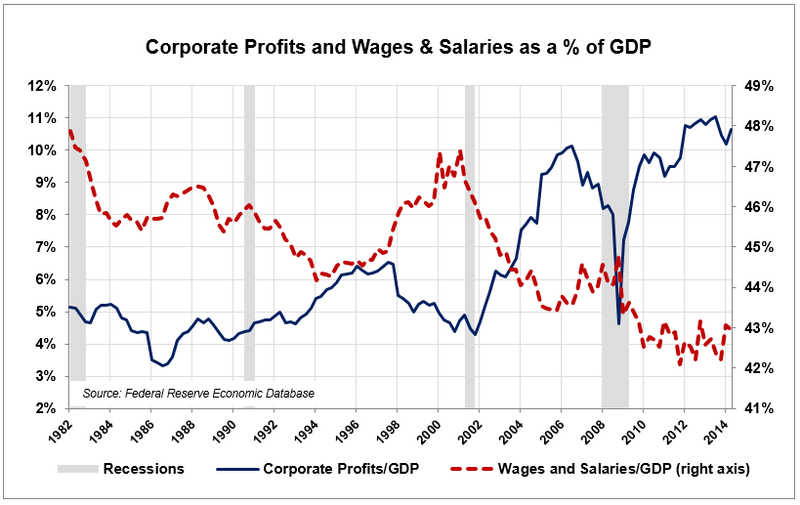 The tragedy here is the decline of labor income, which forms the aggregate demand for goods and services – the primary resource – that drives the economy. There will be more bubbles that burst and more stock market gyrations. There will be more technology to replace workers and more globalization to save even more labor costs. And the consequences affect us all. Such is the nature of the capitalist commons. Garret Hardin’s “tragedy” also implies elements involving morality, responsibility, fairness, duty, cooperation, and mutual respect as offsets to mitigate self-interest. Not for an egalitarian society, but for a sustainable one. We ignore those important values at our own peril. After all, “commons” include air, water, biota, and public land shared by everyone. 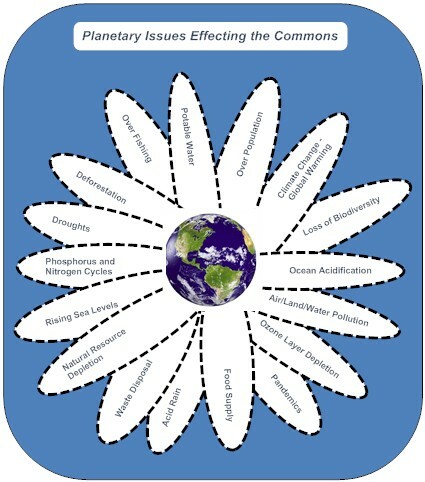 And the tragedy of these commons is already happening. Global warming is a threat to our food supply, to the availability of potable water, and to the disastrous consequences of rising ocean levels. 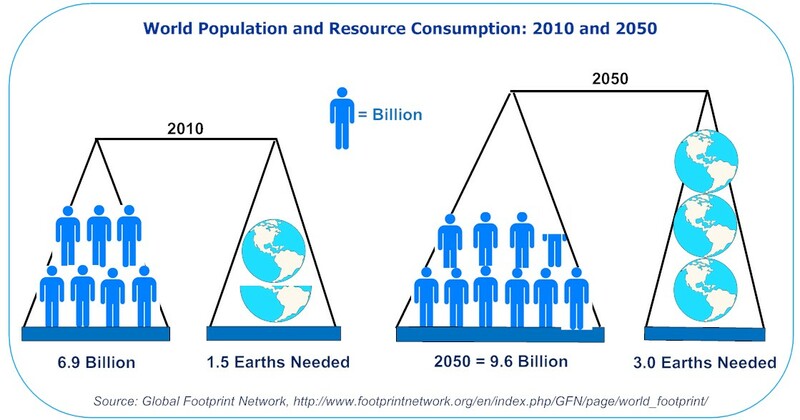 And, sustainability is becoming more critical as resources are consumed faster than they can be replaced and/or replenished. Increasing populations are pushing the plant to its very limits. In fact, resource consumption in the United States is so great that it takes an estimated four earths to maintain that level. And much of that demand has to do with satisfying the goal of increasing economic growth where the resource is fiscal, not physical. The driver, then, of the rush to accumulate wealth is via capitalism. But, as noted above, the priorities of commercial enterprises do not include, or rarely include, consideration of the commons. It is the short-term, self-interest pursuit of profits over the long-term consequences. One possible answer to this dilemma may be found in the Haudenosaunee’s (Iroquois Confederacy) Great Law of Peace, which is discussed in part in Planning Seven Generations Ahead in this blog. But of course, we as a society have failed to follow the wisdom of the Haudenosaunee which was known long before the Industrial Revolution and the rise of capitalism. As a result of the mismanagement and irresponsibility regarding our limited natural resources, we are like the reindeer on St. Andrews Island. The population is increasing, the business world is thriving, and the earth is dying.